No Soliciting Sign - This really works! These designs were perfected through extensive field testing. until finally the most effective combinations of text and images were found. you can just print these images yourself, but only for your personal use please. Of course you can't print something as durable and attractive as a ceramic tile in a cherrywood frame. So come on! Treat yourself! And "Buy American!" 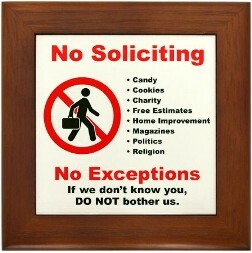 You can buy the real No Soliciting Sign for a pittance and you'll have a sign that is both classy and effective. Accept No Substitutes! 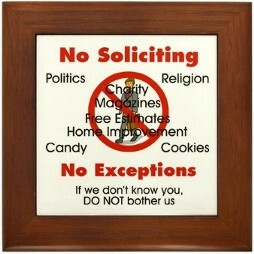 See for yourself how well the No Soliciting Sign works! The No Soliciting Sign caches his eye as soon as he is in range and it maintains his interest until he looks up briefly before walking away. And it works every time! We have nothing against people who are trying to make an honest living, or spread the word about their religious or political beliefs, or who are collecting money for legitimate charities, but that doesn't mean we want them knocking on our door either. No one enjoys being interrupted constantly by door-to-door solicitors pushing one thing or another. It is particularly annoying or disturbing when they are persistent, aggressive or threatening. Our homes should be a safe haven, and yet companies drop off crews of salespeople in our neighborhoods to knock on every door. These companies don't screen their salespeople for criminal records and in some cases entire crews are made up of people undergoing some kind of "rehabilitation." Also, it is quite common for thieves to pose as door-to-door solicitors to case homes for crimes of opportunity. It is dangerous to open your door to strangers, no matter how innocent they might look. And it's safer as well as less aggravating if you can stop them from bothering you in the first place. Many people put up a standard "No Soliciting" sign and then are dismayed to see how many solicitors simply ignore the sign and knock on the door or ring the bell anyway. If you ask solicitors why they ignore your sign, the most common answer is that they are "not selling anything" -- which indicates that they have no idea what "soliciting" means. Not surprising, given the average degree of literacy of those who solicit door-to-door. Those solicitors who do know what soliciting means and choose to ignore your sign anyway, just don't have any respect or consideration for others. They'll typically smirk at you and tell you they've sold lots of whatever it is they're selling to people who had no soliciting signs on their doors. Many are taught to ignore the signs or are told that people who have no soliciting signs actually make the best prospects. After years of frustration with the ignorance and selfishness of these cretins, we finally decided to see if we could design a "No Soliciting" sign that no one with an IQ above a lab rat could possibly ignore. The design of these signs was perfected through extensive field testing, with changes based on feedback from solicitors who ignored it, until finally the most effective combination of text and images was found. This design really works! A decorative ceramic tile in its own Cherrywood frame. The rounded edges and quality construction make this framed tile a stylish way to shoo away those pesky salesman. These signs can be easily hung from a nail but we have heard from some people who were reordering that their signs were stolen. So unless you want to run the same risk, you should mount your sign securely. We recommend that you pre-drill one hole top and bottom and secure with a couple of Phillips head screws, while being careful not to over-tighten. Or you can simply attach your no soliciting sign with a generous helping of glue or calking.